Although slightly lacking in power, this pedal takes inspiration from Mapex's impressive 900 Series, which can only be a good thing. Fully adjustable cam. Smooth and fast action. The three sided beater is a nice little feature. Might not have enough power for some. Sporting the company's trademark yellow base plate, this pedal is unlikely to get lost on a dark stage (useful when you're scrambling to clear your gear offstage at a shared-bill gig). 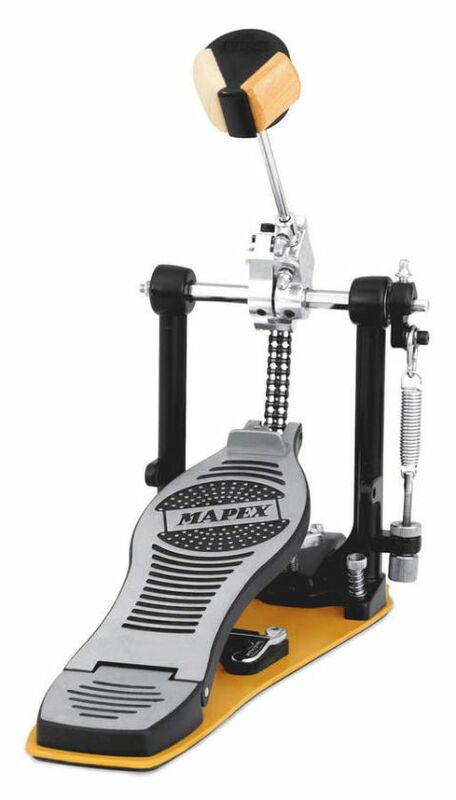 It's well equipped with an adjustable cam and a chain drive mechanism identical to that found on Mapex's 900 series pedals. The action is consummately smooth and the pedal is fast, though the Tama's HP200B model shades it for power. Also unique to Mapex is the three-sided (wood/plastic/felt) beater, giving three distinct sound/feel options.